With his career and personal life suddenly at crossroads, a once-celebrated L.A. chef embarks on a cross-country culinary odyssey with his best friend and young son in an effort to rediscover his creativity and love for cooking. When he started running the kitchen at trendy Brentwood eatery Gauloises, Carl Casper (Jon Favreau) was on of the hottest chefs to hit the L.A. food scene. Now, a decade later, the restaurant is still always full, but creatively Carl is running on empty. Divorced and disconnected from his 11-year-old son, he's convinced cooking is the only thing he's good at- and he yearns to reignite the spark that made him love doing it in the first place. When he learns that popular food blogger Ramsey Michel (Oliver Platt) is coming to review the restaurant, Carl plans to dazzle him with an adventurous new menu. But the restaurant's owner Rive (Dustin Hoffman), insists he serve the same safe and predictable dishes that have kept the place packed year in and year out. Disappointed at the meal's lack of originality, Ramsey writes a scathing review, which- along with a video of Carl's embarrassing out-of-control response- quickly goes viral. With his illustrious career suddenly reduced to a punch line, Carl finds himself jobless with no prospects for work. 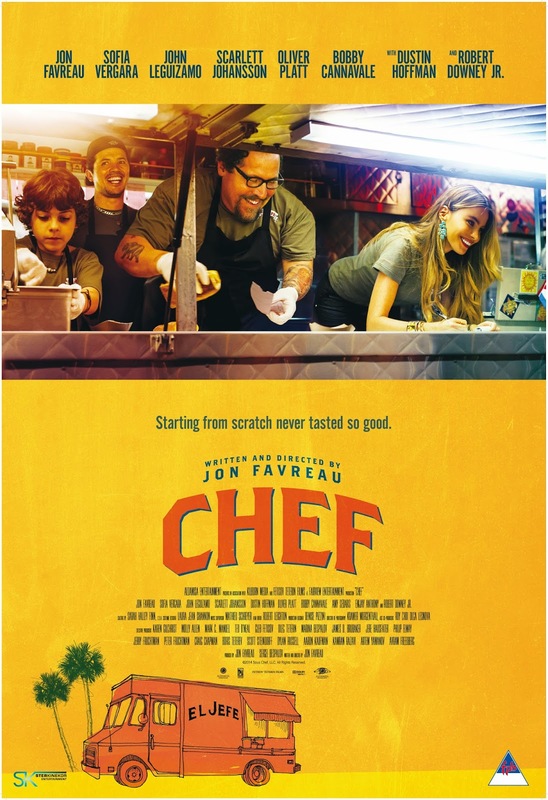 Chef is one of those movies which is worth your time and money. This movie is definitely going for Oscars this year and might win some for sure. It's the most uplifting story and you will really enjoy every scene of the same. The cinematography is great and so is the food shots. The food truck travels through some of the towns of America and you will really love to see the variance in culture. The social media channels has been used to perfection in the movie and are the underlying theme of the movie also. I really loved the acting of Jon Favreau and he is one who has written and directed the movie too. Robert Downey Jr is amazingly cool in one of his scenes. Scarlett Johansson looks beautiful in every scene she is on the screen. But the movie belongs to Emjay Anthony who is the soul of the movie. All the scenes between father and son in this movie will bring you more closer to your heart. It's really a heartfelt movie and if you are blogger like me, you will definitely learn some tips and tricks of the trade. Movie is releasing in Ster Kinekor on 8th Aug 2014. Book your tickets now. More info on twitter and facebook. All eager to catch this one. Thank you for the review. Thanks a lot for reading. You will definitely enjoy the movie. Cheers!! !